God certainly has blessed WLA with wonderfully, amazingly talented music students. Today was another example of them using their musical gifts so well! There were seven events (*1) which advanced to State Solo Ensemble at UW-Oshkosh on April 30, nine events which were awarded 1st, and six events which earned 2nd. Congratulations to all on their hard work! A couple of events got added this week to the WLAHS schedule for March 12 at Kettle Moraine Lutheran High School in Jackson, WI. I've updated an earlier blog entry to show the changes. I had chapel yesterday and today at WLA. Since yesterday was Ash Wednesday, the beginning of the season of Lent, and I was to lead Bible reading (but the Bible reading was from Acts 6 and 7, the stoning of Stephen), I wanted to highlight the change in seasons of the church year in some way yesterday and today. Yesterday we used the Lenten hymn "Savior, When in Dust to Thee." Today, I explained a little about Lent, the color purple, and why there are 40 days in the Lenten season. When does the season of Lent begin? It begins the Wednesday after the Sunday of the Transfiguration (i.e. the last Sunday on Epiphany), but is more properly counted beginning forty days before Easter (Easter Sunday is the Sunday following the Paschal Full Moon (PFM) date for the year). How long is the Lenten season of the Church Year? Lent is 40 days in length, but not including the Sundays before Easter. Each of the Sundays of Lent are considered mini-Easters, a gradually growing celebration of Jesus' victory over sin and death, culminating in Easter Sunday, the Resurrection of Our Lord. What is the liturgical color of Lent? Paraments in Lent change from the green of the Epiphany season immediately to black on Ash Wednesday (a jolting reminder that the next time black will be used as a parament color is the day Jesus died–Good Friday), to purple for the remainder of the 40 days of Lent, with only one other change to White on Maundy Thursday. What do the purple paraments symbolize during Lent? Purple is the royal color, the most costly color fabric could be dyed in ancient times (Tyrian Purple, Royal Purple). Purple reminds us that King Jesus put aside his divinity (i.e. His royalty) and was tempted in every way, just as we are—yet he did not sin. (Heb. 4:15). Purple also symbolizes penitence and self-discipline. 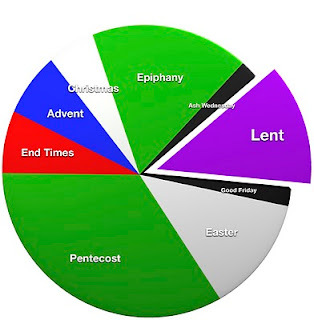 How does the liturgy change during Lent? The two most striking absences during Lent are the omission of the Hymn or Song of Praise (Gloria; O Lord, Our Lord, etc.) and the absence of Alleluias. The last time alleluias are sung in the worship service are Transfiguration Sunday before they are joyously brought back again on Easter Sunday. What do the 40 days of Lent symbolize? Elijah spent 40 days and nights walking to Mt. Horeb. Jonah gave the city of Ninevah 40 days to repent. Jesus ascended into Heaven 40 days after he rose from the dead. Jesus spent 40 hours in the tomb from Good Friday to Easter Sunday. In a nutshell, the 40 days of Lent symbolize a period of trial, repentance, probation, or chastisement. The two most prominent 40's in the Bible which Lent points back to are Jesus' 40 day temptation (Matthew 4:1-11) and the Israelites' 40 year wandering in the wilderness (Deuteronomy 8:1-5). Notice the connection between the two, especially how Jesus quotes Deuteronomy 8:3 to Satan. What about fasting during Lent, or giving up something for Lent? While it is true that Jesus fasted in the wilderness during the 40 days of temptation by Satan, we shouldn't think that this is a command for us to also fast during the season of Lent or to give up something for Lent. But it also isn't anything that God's Word commands or forbids, so if a Christian wants to give something up for Lent as a way of remembering or personalizing the great sacrifice that Christ made on the cross for our sins, then that Christian is certainly free to do so--as long as he or she does not "judge" or "look down on" other Christians who do not choose to do this (and vice-versa). It's like anything you do–do a good thing for the wrong reason and it's bad, but do a good thing for a good reason and it's blessed. It brings to mind a memorization from many years ago for me in 7th and 8th grade Catechism class: "Fasting and bodily preparation is, indeed, a fine outward custom; but he is truly worthy and well prepared who has faith in these words, 'Given and shed for you for the remission of sins.'" (Luther's Catechism, Sacrament of the Altar, Fourthly, p. 225 NPH © 1956 ed. C. Gausewitz, a.k.a. "The Brown Catechism"). Luther acknowledged in his explanation to the fourth part of Holy Communion that "fasting and other outward preparations may serve a good purpose", but they don't make you better by doing them. What really matters is what has been done for us: Jesus, led by the Spirit, faced every temptation that we face daily, and yet never sinned. Jesus fasted 40 days and 40 night so he could be the fulfillment of the law for us ("man shall not live on bread alone but on every Word that comes from the mouth of God." Mt. 4:4, Dt. 8:3), not to teach us to fast. Jesus was tested by Satan to show us how to stand up against temptation: use the perfect power of God's Word to defeat it, do not use the imperfect power of human intellect or actions. Jesus was tested for 40 days in the desert before beginning his public ministry just like the Children of Israel were tested for 40 years in the wilderness before entering the Promised Land ("to humble and test you in order to know what was in your heart, whether or not you would keep his commands.") God was angry with the Children of Israel for not obeying his commands and following other gods than himself as they came out of Egypt. God let a whole generation die away in the wilderness so that those who entered the Promised Land would be new and would follow Him. The second weekend of District Solo Ensemble is upon us! Congratulations WLA Music students! What an excellent use of God's gift of your musical abilities and talents this first Solo Ensemble weekend! There were 11 starred firsts (*1), 9 firsts (1), and seven seconds (2). The 10 starred firsts advance to the State Solo Ensemble Music Festival at UW-Oshkosh on April 30, 2011. To see what pieces they performed, consult the WSMA Festival Music List. This weekend was mostly instrumental and piano performances. There will be a second weekend, March 12, which will be mostly vocal and piano performances. That schedule will be posted early next week. Have you written your introduction? (Good morning. 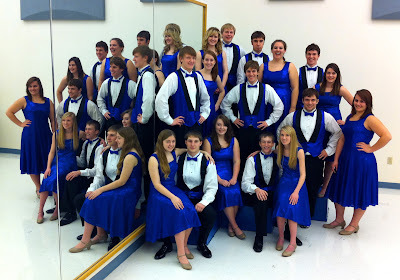 My name is (say your name) and I’m from Winnebago Lutheran Academy in Fond du Lac. This is my accompanist (say accompanist’s name) and I will be singing a (name of category, e.g. “Soprano Solo” or “Barbershop Quartet”) entitled (say name of piece) by (say composer’s name). 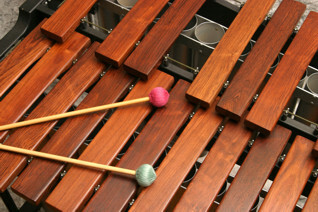 Then briefly describe something interesting about your piece (an aspect of style, form, technique, harmony, rhythm, or melody.) Musical Theater introductions should also set the scene for the performance (i.e. describe who you are portraying and what the piece you are singing has to do with the musical from which it is taken). Be at Kettle at least 45 minutes before you perform. Walk the building to find out where you perform (look at the site number on the schedule (March 5, March 12) and find it on the room map) and where the warm up rooms are. Then go warm up your voice! Sing! It’s your choice whether to sit in your room and watch performances before you or wait in the hall. Take deep breaths. Relax! The judge wants to hear your best and wants to help you get even better. Remember to thank God for the blessing of singing He’s given to you and ask His blessing on your performance. Prayer works! If you perform with your own copy of the music, don’t bury your eyes in the score. Look up at your audience and the judge. Smile (if you piece calls for it) or show other emotions that show you understand what you are singing. If you can perform from memory, all the better! When they are done, stick around to get your judge’s copy of your piece and go out into the hall to relax and reflect on how you performed and what the judge said. Remember, you’re using someone else’s gifts for the weekend (God’s). Make Him proud by using them well. Thank Him for the opportunities He gave you to use His gifts. Take the judge’s copy back to WLA on Monday, March 21 and give back to Mr. Witte. Results are usually posted within 45 minutes to an hour after your performance. There will be a central location with a lot of sheets taped to a wall with many people crowded around either crying, screaming, or being quiet. If you choose not to wait for your results, you may leave. I’ll stay around until the end and get everyone’s critiques and results and bring them back to WLA to be handed out. If your performed a Class A solo or ensemble and got a *1, then you have been advanced to the State Solo/Ensemble Festival, Saturday, April 30, 2011 at UW-Oshkosh. Congratulations! Given the length of time in between, you have to option of keeping your current piece going or starting a brand new class A piece for State. See Mr. Witte for details. GOD’S BLESSINGS ON YOUR PERFORMANCES!